Hopefully you enjoy Chinese as much as we do and, like you, every once in a while, we don't want leftovers and just don't feel like cooking. We want something different. This time the Prez pulled out the Chinese menu that's in the desk drawer. Having ordered fried shrimp and fries, I got out the plates and silverware while the Prez went to pick up the order. Walking in the door, he said,"the fella said he put something extra in our order." As the Prez put his Pork Lo Mein, Pork Fried Rice and white rice on his plate, I pulled out my order of shrimp. Mind you, normally the order consists of 14. Mine had 18! After looking at the huge order of fries, I found the "surprise." It was a full order of Crab Rangoon! YUM! Of course, the highlight to getting Chinese is the fortune cookie. Somehow they always say positive uplifting things (perhaps that's how I interpret them). Anyway, I am always excited about my fortune cookie and this time was the first time it really hit home. Oh, one more thing. Re~read the fortune. There's definitely a lesson here. How often we forget to be grateful. Thanks for the reminder. JP! You ordered shrimp and fries? From the Chinese restaurant? That's just wrong! Next time try the homestyle bean curd. Mmmmmm. I have SUCH a hankering for Chinese food... there's this buffet restaurant down the road from us called Mandarin and just thinking about it makes me WEEP. It wasn't that great a comment that it needed to be said twice... but c'est la vie. By the way, the fortune is awesome... but you lost me at the word "fries." I'm with Lisa. What are you thinking, fries and fried shrimp! That's about as Chinese as fried cornbread. haha I do love your fortune cookie. yum. chinese! i've been having a craving...for quite some time now! I love Chinese food but it don't love me... I get sick when I eat out so I am now making my own and I'm fine. I found a you tube video that showed me how to make the rice and I sampled some egg rolls from Sams one day that are even better than the ones in the restaurant. I'm with you there. And I like Chinese, too. I really do love Chinese and the fortune cookies with such good advice as you got, are a great way to end the meal! I hope you're having a good weekend!! One of the best things about having Chinese food is getting the fortune cookie. 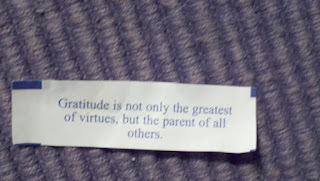 While I don't usually eat the cookie, I always look forward to the fortune it contains...this was a good one. Some are not so good. I am actually coming to your site re. the Follower linky blog hop. I AM FOLLOWING YOU *** WILL YOU FOLLOW ME BACK ? Thank you so much when you do.